DVD: 2-Disc set; widescreen 1.77:1/16x9; Audio Italian Monaural; subtitles English; closed-captioned; single sided - dual layered; 35 chapters; Not Rated; 143 min. ; $39.95; street date 6/05/01. Supplements: Audio Commentary by Film Historian Gene Youngblood; “Antonioni: Documents and Testimonials” Documentary; Writings By Antonioni, Read By Jack Nicholson - plus Nicholson’s Personal recollections of the Director; Original Theatrical Trailer; Restoration Demonstration; Production Notes. As I noted in my review of 2001: A Space Odyssey, the slow pace of that film can really throw off viewers, and I was among those who needed repeated screenings of it to fully take in the point. Michelangelo Antonioni’s 1960 flick L’Avventura seems to fall into the same category. While that may bode well for future viewings of the movie, it meant that my initial examination of the piece was an exceedingly rough ride. In L’Avventura - which can be translated as either “The Adventure” or “The Fling” according to the liner notes - the story follows some bored, idle rich folks. At the start, Anna (Lea Massari) is about to reunite with her boyfriend Sandro (Gabriele Ferzetti) and go on a boat escapade with some friends, including Claudia (Monica Vitti). Although Anna hasn’t seen Sandro for months, she feels no joy about their reunification, and she seems reluctant to even go on the trip. Nonetheless, she does take the journey, and all seems fairly well for a while. However, about a third of the way through the movie, Anna disappears without explanation. For the remainder of the picture, the others - mainly Sandro and Claudia - attempt to locate her. Well, they sort of try to find her. Frankly, their efforts quickly become half-hearted, and the two cultivate a romance of their own. Anna’s presence hangs over this affair, but it doesn’t stop it, as the pair continue to go through some motions in their search but they really don’t seem to care. As I noted at the start of this review, I’d never seen L’Avventura before I got this DVD, and I knew little about it prior to my screening. This seems to be the kind of film that needs repeated viewings to become more compelling. Unfortunately, I was so bored throughout the movie that I feel little interest in attempting further explorations of it; while it offered some interesting techniques, the story lacks much to interest the viewer. Granted, that was part of director Michelangelo Antonioni’s point. He was a pioneer of the “neorealist” style of filmmaking, one that attempted to remove much of the artificially theatrical elements of movies. Unlike traditional flicks that are story-oriented and consistently work toward a certain end, this style of film works at a more leisurely pace, and it doesn’t always bother to offer material that serves the plot. Things happen and they don’t always - or even usually - have any form of deeper meaning. I’m all for this kind of style, as I think it’s an interesting way to approach movies. Too many films telegraph their intentions and meanings too harshly, and it’s good to see some that make things more vague. As such, I really liked the lack of consistent focus found in L’Avventura and the fact it doesn’t heavily emphasize certain events. I admire films that leave things up to the viewer to a large degree, and that’s definitely the case here. However, I think for this kind of movie to work best, it really needs to have a strong story onto which it can hang its hat. If we’re to watch something that doesn’t attempt to badger us with its plot, then the underlying tale needs to be clear enough so that we can ignore it. This may seem odd, and perhaps I’m not explaining myself well, but I feel that if the director wants to let a story veer off on its own path, then the framework that underlies the tale needs to be sturdy. I didn’t think that was the case for L’Avventura. As a mystery, it lacks suspense or involvement. As a character piece, it fails to provide great depth or insight. According to the liner notes on this DVD, L’Avventura is “Antonioni’s penetrating study of the idle upper class offers stinging observations on spiritual isolation and the many meanings of love”. Umm… okay. Frankly, I thought it was an exercise in the obvious. We’re supposed to be surprised when we learn that the idle rich are empty and shallow? That seems to be the movie’s main point, but if that’s the best it can do, then I’m not sure why it bothered. It’s not exactly a shock to learn that people whose lives revolve around parties and frivolity aren’t exactly deep. L’Avventura nicely communicates the emptiness of their lives, as it lets us experience this firsthand. Unfortunately, that didn’t make for the world’s most compelling film. Frankly, I thought it worked better as a cinematic experiment than as an engrossing piece of work. L’Avventura still inspires heaps of praise, and people seem to feel that it really is a rich, incisive work. Perhaps my opinion would change with additional viewings, but right now, I see little depth here. The points made by the characterizations are so obvious that they provide nothing new. While L’Avventura made an admirable attempt to broaden cinematic horizons, the result seemed slow and meandering. L’Avventura appears in an aspect ratio of approximately 1.77:1 on this single-sided, dual-layered DVD; the image has been enhanced for 16X9 televisions. Overall, Criterion did an excellent job with the film as the DVD presented a consistently solid picture. Sharpness consistently seemed to be excellent throughout the movie. At all times, I found the image to appear crisp and detailed. No signs of softness or fuzziness occurred during the film, as it always looked accurate and concise. However, some evidence of jagged edges appeared, and moiré effects were a periodic problem. Shutters, blinds and dress patterns caused the strongest concerns; they could occasionally offer an unfortunate shimmering appearance. Print flaws cropped with regularity, but I thought they seemed reasonably minor for an older film. Grain seemed present through most of the film, although it always maintained a low profile; grain stayed light at all times. Other concerns were more problematic. A mix of white specks and black grit cropped up through the movie, and stronger defects also showed up at times. I saw some small nicks, a few streaks, and periodic appearances of thin vertical lines. Again, none of these concerns seemed to be excessive, especially when one considers the age of the movie, but they appeared nonetheless. Black levels looked terrifically deep and rich throughout L’Avventura. The movie presented a rich silver image that displayed excellent contrast. Shadow detail also appeared clear and appropriately opaque with no signs of excessive thickness. Despite some concerns related to print flaws and moiré effects, I really was quite pleased with the picture of L’Avventura, as it often provided a lovely and sumptuous viewing experience. The movie’s monaural soundtrack wasn’t quite as pleasing, but it seemed to be satisfactory for its era. Some lines showed obvious looping, and I noticed a minor lip-synch problem at times, but dialogue consistently appeared reasonably natural and warm. Speech occasionally sounded a bit thin, but that was to be expected for such old material, and most of the lines worked well. Dialogue showed no signs of edginess and seemed to be intelligible, though I can’t state this for certain since I don’t speak Italian. Effects came across as acceptably clean and realistic. They remained a fairly subdued aspect of the mix, and they could be somewhat flat, but as a whole, they sounded fine for the era. Music was even less involving, as the film’s score didn’t make an appearance until about half an hour into L’Avventura. After that, the score only popped up on a few occasions; apparently Antonioni disliked movie music and used it only sporadically in some of his films. In any case, the score sounded a bit strident and thin, but it seemed to be reasonably clear. As a whole, the soundtrack lacked dynamic range. It stayed within the midrange and didn’t present very crisp highs or deep lows. I detected a smattering of source flaws with the audio. I heard a little hiss at times, and there also was a minor fluttering noise that occurred around the two-hour mark. Despite these small concerns, I still felt that the soundtrack of L’Avventura worked fairly well considering the age of the movie. The two-DVD release of L’Avventura packs in a bunch of extras, starting with an audio commentary from film historian Gene Youngblood. Recorded in 1989, Youngblood was a long-time fan of the film, and his affection clearly comes through during this fairly interesting piece. Youngblood’s remarks are generally split between interpretation of L’Avventura and discussion of the production and its participants. As such, I thought it was a generally compelling affair. Youngblood clearly adores L’Avventura, and his affection for the film comes through during this track. As one who feels much less positively about it, I appreciated his discussion of its many nuances. This didn’t make me wild about the movie, but it helped me get a better grasp on the film’s positive aspects. Other than the audio commentary, all of the supplements appear on DVD Two. The main attraction here is Antonioni: Documents and Testimonials. Created in 1966 by the Film Board of Canada, this 58-minute and 10-second piece was the “first documentary about Antonioni to receive his approval”. Directed by Gianfranco Mingozzi, the show offers French narration with Italian dialogue from its subjects. Overall, I thought this was a decent program, though it didn’t really captivate me. It follows Antonioni’s career chronologically and it involves lots of collaborators. We learn some nice tidbits about the director’s life and work - at least through the mid-Sixties, which means we don’t hear about 1966’s Blowup, arguably his most famous film - and get a decent overall summary. I particularly enjoyed the shots from movie sets, as this “behind the scenes” material offered a nice look at the director’s style. Ultimately, the program was a little too cold and distant to become really compelling, but it was still a generally watchable and interesting piece. Next is a cool addition from a huge star. Jack Nicholson Reads Essays By Antonioni offers exactly what it states. As noted on the DVD, Nicholson reads “part of the publicity materials circulated to the press and foreign distributors of L’Avventura”. He also discusses his own experiences with the director. There are three sections: “L’Avventura: A Moral Adventure”; “Reflections On the Film Actor”; and “Working With Antonioni”. Each runs between nine minutes, 45 seconds and five minutes, 12 seconds for a total of 21 minutes, five seconds of narration. A few additional supplements round out this package. We get the film’s original theatrical trailer, which lasts for two minutes and 10 seconds. A three and a half minute Restoration Demonstration shows the improvements made to the image. I find these to be self-congratulatory, but they can be interesting to watch as they demonstrate the clean-up process. Lastly, the DVD’s booklet includes a few different text pieces. We get a short essay by film professor Geoffrey Nowell-Smith. This was a decent little piece that brings some interpretation to the table. It doesn’t replace the more extensive discussion by Youngblood in the commentary, but it makes for a minor complement. More interesting is the “Cannes Statement” by Antonioni. This offers a good discussion of his movie’s themes and his thoughts, all prepared at the time of the flick’s premiere. Speaking of which, we also find “An Open Letter”. 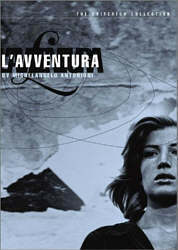 Following the film’s legendarily negative reception at Cannes, some movie partisans sent out this statement: “Aware of the exceptional importance of Michelangelo Antonioni’s film, L’Avventura, and appalled by the displays of hostility it has aroused, the undersigned critics and members of the profession are anxious to express their admiration for the maker of this film. Convinced that they will be joined by others who share their enthusiasm, they invite them to make their support known.” Many folks, most of whom were prominent in the Italian film industry, signed it. Frankly, I thought this note seemed to be arrogant and condescending. As a gesture of support for a colleague, it has some positives, but I found it to appear narrow-minded. It left me with the impression that no one is allowed to express anything but total admiration for L’Avventura; to do otherwise is to risk censure. Like it or not, the reactions displayed by the Cannes crowd were genuine, and just because someone feels otherwise doesn’t negate that. People forget that “right” and “wrong” don’t exist; there are only opinions, and dissenting ones are just as valid. Often folks who really should know better are the worst offenders. For example, a review of L’Avventura on another website essentially accuses its detractors of being immature, simplistic doofs who can’t maintain an attention span. That kind of intolerant attitude does nothing to convince non-fans of their mistake; all it accomplishes is to further distance people from the work. Perhaps I’m sensitive because I’m among those dissenters. Actually, that’s not totally true, for my thoughts about L’Avventura don’t seem to be nearly as negative as the ones displayed by the Cannes crowd. Nonetheless, I felt the film was an interesting experiment but it ultimately seemed cold and fairly pointless. The DVD offers very nice picture with satisfying sound and a nice package of extras. While L’Avventura is not something that the general public will embrace, fans of the film should be exceedingly pleased with this terrific package.